Adding smartphone ownership to home broadband use, we see that the proportion of young adults who have ”home broadband” under this definition increases from 80% to 95%, while including smartphones has no discernible impact on access rates for seniors—the 46% of seniors who have broadband or a smartphone is little different from the 43% who have broadband at all. Buying into a personal broadband account is mainly an age thing, which is to say it’s mainly an interest thing. Pew defines “young adults” as those aged 18 – 30, the wide swathe of the population that encompasses everyone who has come of age since the Internet was opened up to the general public (by Al Gore) in the mid ’90s. As a group, younger people tend to have less wealth than older people, and they tend to be better educated. 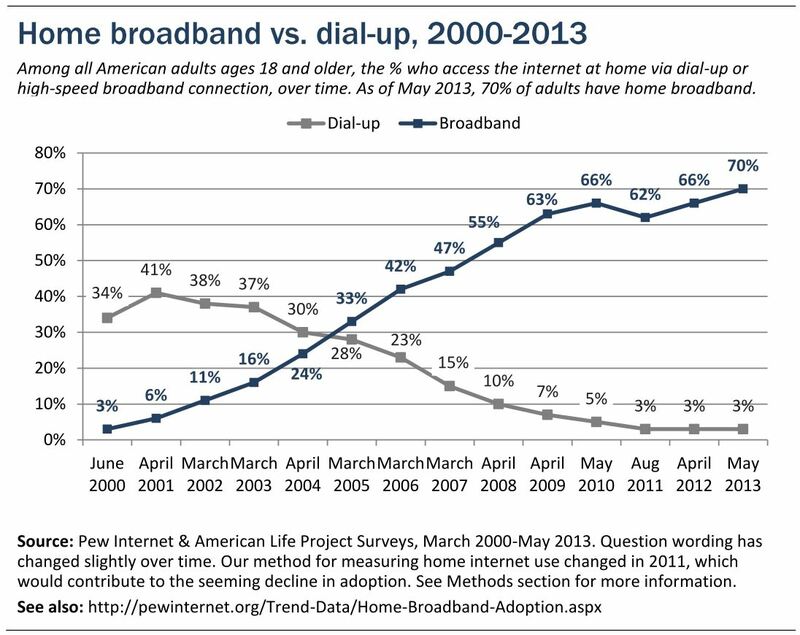 Wealth, education, and ethnicity correlate with broadband subscriptions, but not as strongly as age. Similarly, income correlates with subscriptions, but not as strongly as interest. So if you’re interested you subscribe, and if you aren’t you don’t, with certain narrow exceptions. The dial-up group is interesting, as it has remained steady at 3% of households for the past two years, while broadband subscriptions by wire have gone up from 62% to 70% and all high speed Internet use at home has reached 80%. Currently, 85% Americans say they use the Internet somewhere (page 10.) That’s a lot more than most of us probably believe. While Pew regards this as an unresolved question, it seems to me that it’s not completely reasonable to assume that everyone who has a smartphone at home and no wired connection can only access the Internet through the phone. Most smartphones have a tethering feature that allows it to be used as a mobile hotspot for an associated laptop, desktop, or tablet, and in this mode the larger device is capable to doing everything it can do by wire with the exception of a lot of video streaming; mobile hot spots tend to have data caps ranging from 3 to 10 gigabytes per month that make them impractical for TV rerun viewing over Netflix or for hard drive backups to the cloud. But short of that, the Internet is your oyster through a 4G mobile hotspot at speeds that compare favorably with the popular wired plans. According to the report, almost 90 percent of college graduates have high-speed Internet access at home, as do households earning more than $75,000. Compare that to only 37 percent of those who have not completed high school — as well as 54 percent of households with income less than $30,000 — that have such access. There continue to be racial differences as well, with blacks and Latinos less likely to have high-speed Internet access than whites. While the report certainly does highlight these relationships, the principal correlation it finds is age-related, as noted, and Crawford fails to mention this at all; I can only assume that the interest factor that young adults display to a greater degree than older people simply interferes with her preferred narrative. We must do better. We must define high-speed Internet access to be fixed service of 100 Mbps, upload and download; get away from the use of the word “broadband,” with all of its confusing connotations; and make sure that these services are available to all Americans at reasonable prices. We can always “do better,” but it strikes me as unreasonable not to recognize where we really are. 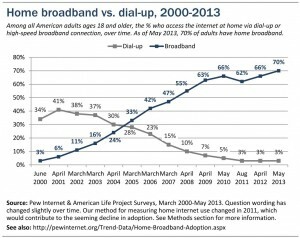 The Pew report shows a solid, steady, sustainable rate of progress toward universal Internet adoption and use; universal use should be the first goal of Internet policy, not some arbitrary definition of “a really cool Internet connection.” Let’s get everyone connected first, and worry about speed when and if there’s a legitimate reason to believe it needs to be faster. That not where we are today.